The Evolution of a Sweater – Maine. Ocean. Camping. I’ve always been interested in all things fibery and had a stint as a fabric designer and vendor in France during the late 80’s and early 90’s. When I moved to Maine, Hattie Clingerman from Winterport came to the campground to teach felting. I’ve been hooked on wool ever since. 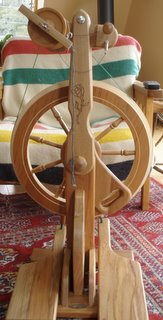 Last year we hosted our first annual Fiber College on Penobscot Bay and that nudged a drop spindle in my hands during the Common Ground Fair and by November I became the proud owner of a Majacraft Rose spinning wheel. I learned to spin by watching the ladies at the College, replaying a DVD ten times and relying on the advice of the Yahoo groups: spindlers , Spin-List and dyehappy. I’m not a good spinner but I’m learning. The experience of relying on an on-line community for nurturing a budding interest has been absolutely wonderful…I’d suggest it to anyone. The generosity and kindness that flows through these on-line voices is just one more place where the goodness of people shines through. Before March I was spinning from my stash of fiber collected over the years. 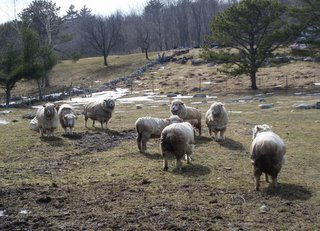 I wanted to try the WHOLE SHEBANG so Steven and I went to the Beau Chemin Farm in Waldoboro and bought 3 pounds of raw Leicester Longwool Fleece…the staple length was easily 6-8 inches and the curls were lusterous and so soft. The Leicester Longwool breed is threatened with extinction because so few people raise them around the world. My limited research revealed that their wool is valued for rugs because of its durability but with Shepard Wayne Meyer’s encouragement I treated his fleece as sweater wool. He couldn’t have been more correct. When I knit a tiny swatch and tucked it into my bra for the “itch factor” I forgot it was there. The first thing I did when I got home was start the scouring process; Washing it in batches with lots of dawn dish soap and hot water…my newest obsession washed from a dingy cream to a glowing white. 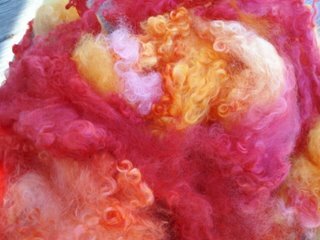 Then I dyed the bulk of the curls in shades of fruit sherbert…cantalope, watermelon, mango, peach, cherry and papaya. The rest either stayed naturally white or became 15 different shades of green. My intent was for the soft the curls poke through. 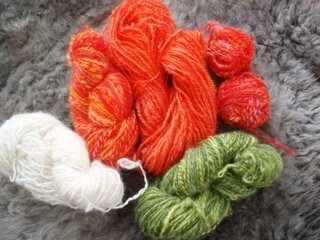 I spun lightly and with the intent of creating a lofty two ply yarn. 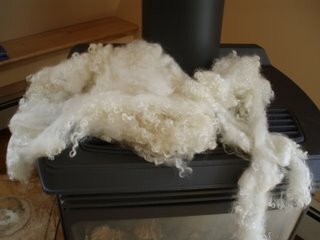 In my limited experience, the yarn is as soft and full of texture as mohair. With the spun yarn whispering softly into my ear about how it would best like to be used, I lined up my weapons: my design notebook, the Vogue Knitting Bible my SIL gave me for my birthday, a box of colored pencils, and ruler. 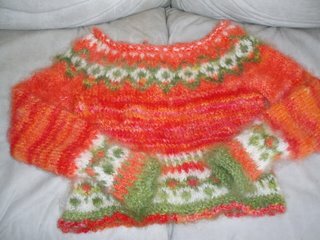 I wanted to make a sweater unique to me. 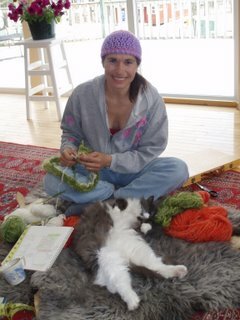 Campa the cat found the whole process absolutely relaxing! I modified an existing Icelandic sweater pattern to make a close fitting, almost off the shoulder design that seems like a perfect balance for warm sweater in the spring…I can wear it with a shirt or not and stay comfortable when the mornings dip to the 50’s but the calendar insists that we should be wearing the brighter colors of summer…a dilemma that you can only appreciate when you live in a northern, coastal climate. I loved the process, the finished product is 95% all that I hoped for. If you look closely you can see where the yarn is over or underspun and I would have added 6 more stitches where the sleeves meet the yoke. It’s a wonderful way to learn about sweater construction and I’ve already started on my new project: Converting a CMV lamb’s fleece into a sweater for Steven…when it is completed will all be decided upon by the Mother Nature once again. The little girl in me would just like to scream: See, I started AND finished a project! Next Is it Really Spring? I LOVE your sweater, it’s beautiful. thanks for sharing. Absolutely beautiful!!!!! I love the colors and design. What an accomplishment. This makes me realize I have too many ufo’s. Just loved loved LOVED your sweater! Whoo hoo I hope to accomplish something like that one day – when I am unstuck from the freeform swamp! WOW! What a great job! I’m getting a moorit shetland sheep fleece I hope to spin and knit into a sweater. I love your colors! That’s a lovely sweater, Astrig. What a marvelous reminder of the beginning of your spinning career.